Ghost Corps, the official Columbia Pictures Industries division focused on expanding the Ghostbusters brand, posted an interesting discovery last Thursday on Facebook. The official page posted an image of three film reels that came from director Ivan Reitman's personal storage. Written on the three boxes are "Honey Mooners", "Bill Murray", and "Fort Demering". The first reel is likely a deleted scene that has already been revealed when two newlyweds encounter Slimer at the hotel. The "Bill Murray" reel is a mystery, but the date on the box is marked Oct 31, 1984 which is 4 months after the original film was released. It also says "Columbia Pictures Advertising" so could this have been footage for the VHS release in 1985? The final reel could be what Ghostheads have really been waiting a long time to see, the deleted Fort Detmerring scene. 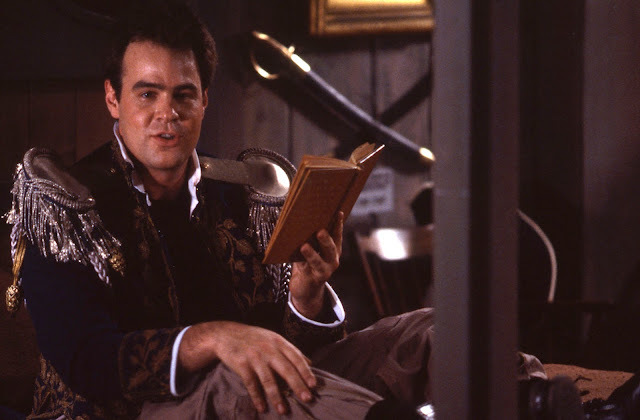 It's the entire scene that was cut for the sake of time which culminated into Ray Stanz (Dan Aykroyd) in a military uniform getting "serviced" by a ghost. Stills from the footage have surfaced (headline image above) but the scene has never made it onto any Blu-ray/DVD releases. From the comments on the Ghost Corps picture, Alex Newborn compared the scene numbers on the reel boxes to the actual 1984 shooting script. "Scene 117 is the exterior arrival of the Ecto at Fort Detmerring, with Scene 118 being an interior 'Gunner's Corridor' scene at the Fort where Ray and Winston decide to split up. Oddly, scene 125 is denoted as 'Omitted,' but is smack in the middle of the 'Officer's Quarters' footage which was cut down for the dream sequence in the montage." Sounds like the Fort Detmerring scene might finally be revealed but will it wait for yet another Ghostbusters home release? The film receive a 4K Blu-ray release in 2014 and a 4K Ultra HD Blu-ray release just last year. We'll just have to keep our eyes peeled to Ghost Corps for an update on the found footage.